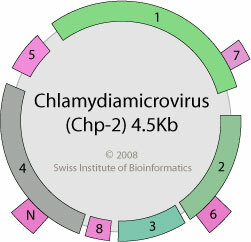 Circular, ssDNA genome (+) of 4.4 to 6.1kb. replication occurs via dsDNA intermediate and rolling circle. Early and late genes promoters tightly regulates the timing of gene expression, which is crucial for the replication cycle. Micro from Greek, “small”, referring to virion size. INTERACTIONS Cell receptors: Presumably a sugar residue in lipopolysaccharide (LPS) at the surface of host cell.